State-run North Korean news agency has pinned the blame for the assassination of Kim Jong Nam on Malaysia’s authorities because he died on Malaysian soil – as simple as that – the state media outlet argued. “What merits more serious attention is the fact that the unjust acts of the Malaysian side are timed to coincide with the anti-DPRK [Democratic People’s Republic of Korea] conspiratorial racket launched by the South Korean authorities,” state news agency KCNA said, as quoted by Reuters. “The biggest responsibility for his death rests with the government of Malaysia as the citizen of the DPRK died in its land,” KCNA said. Kim died on February 14 after being attacked by two suspects at Kuala Lumpur airport. His body is now in a hospital mortuary. Earlier, North Korean state media slammed Malaysian forensic authorities for carrying out an “illegal and immoral” autopsy on the victim. “Malaysia is obliged to hand his body to the DPRK side, as it made an autopsy and forensic examination of it in an illegal and immoral manner,” read a statement published by North Korean Jurists Committee (KCNA), as cited by AFP. “This proves that the Malaysian side is going to politicize the transfer of the body in utter disregard of international law and morality and thus attain a sinister purpose,” it said. Meanwhile, North Koreans citizens are wanted in Malaysia in connection with Kim Jong Nam’s death, including a top DPRK embassy official in Kuala Lumpur, as well as an officer in North Korea’s national airline, Air Koryo. 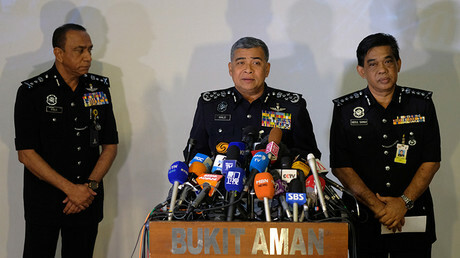 Malaysia’s chief of police, Khalid Abu Bakar, said on Thursday that he has requested that international police agency Interpol issue an alert for four North Koreans suspected of being connected with the case, who are believed to have left Malaysia already. One North Korean citizen is currently in custody. The police have also confirmed that Kim died from poisoning while he was waiting for his flight to Macau, adding that the attack had been carefully planned and the assasins were well-trained. Kim was once seen as a possible successor to his father, North Korean leader Kim Jong-il, but he gave up any political ambitions in favor of his younger half-brother, Kim Jong-un. The murder victim spent many years living abroad keeping low profile. Unconfirmed media reports claimed that he sent a message to his younger sibling pleading for his life after being forced into exile.